JON GRUDEN’S RETURN to coaching with the Oakland Raiders now feels like the NFL’s worst-kept secret and that reunion is going to be a lucrative one for the Super Bowl-winning coach. ESPN’s Adam Schefter was a guest on The Dan Patrick Show when he was asked about an earlier report that speculated Gruden would receive an ownership stake in the team as part of his contract. Schefter downplayed that possibility, but did say that the deal would be the biggest for any coach. The value of contracts for head coaches are not as widely known as those for the players. Bill Belichick is believed to be among the highest-paid coaches in the NFL with a salary in the $7-9 million range. If the Raiders did offer Gruden an ownership stake, there would be a huge catch — it must be approved by other NFL owners, and there is a good reason to think they would be reluctant to do so. In an earlier report by Schefter and Chris Mortensen for ESPN, one ownership source said that the owners “might not be so quick to approve the deal” because they wouldn’t want to set a precedent. While no official announcement has been made regarding Gruden and the Raiders’ now-vacant coaching position, all signs point to that being all but a formality. On Sunday night, ESPN’s Adam Schefter said Gruden will be the next coach of the Raiders, a proclamation he presumably would not make without some reassurance of its accuracy from fellow ESPNer Gruden. In addition, Ian Rapoport of the NFL Network reported that Gruden is expected to accept the Raiders’ offer, but that he is slow-playing any announcement in an effort to comply with the NFL’s “Rooney Rule” requiring teams to interview minority candidates. 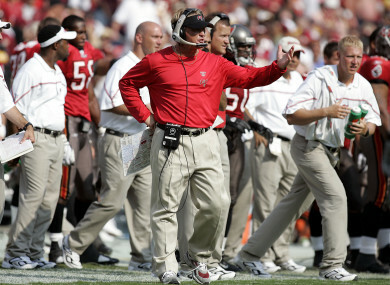 Rapoport added that Gruden has already picked a defensive coordinator. Email “Jon Gruden's Raiders contract expected to be richest ever for a coach 'by a landslide'”. Feedback on “Jon Gruden's Raiders contract expected to be richest ever for a coach 'by a landslide'”.